How Does a Solar Eclipse Impact the Electric Grid? Millions of Americans traveled long distances in hopes of getting a front-row seat for the dance of the heavens today, watching the moon eclipse the sun, from Portland, Oregon, to Charleston, South Carolina. Hundreds more had spent months preparing for an odd complication of the event: the very sudden loss of up to 9,000 megawatts as solar panels were cast into shadow, and then its very quick return. The lost production is the equivalent of about fifteen good-sized coal plants. How do you keep the lights on when the sun suddenly goes out? The loss and rebound of generation is much larger than the system usually faces, but experts made some serious advance preparation, and were hopeful largely because of the diversity of generators. 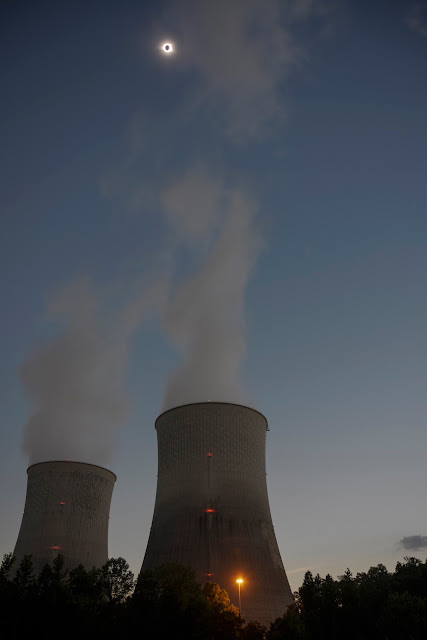 Nuclear plants continue to provide the backbone of the system, and generators running on natural gas were called on to power up quickly, and as the sun reappeared, power down even faster. Such diversity is important because the system has to function through more frequent challenges, like extreme cold, water droughts, wind droughts and other problems. The eclipse will vary from place to place. The path of the totality crosses twelve states; but the geometry is such that planners knew that the sun would be 95% obscured in parts of northern California, and 72% obscured in southern Nevada, which is electrically integrated with California. At times, California gets 40 percent of its energy from solar panels, and depending on cloud cover, it was set up to lose nearly three-quarters of that. The California independent grid operator calculated in advance that power output will drop by 70 megawatts a minute (A megawatt is enough to run a Walmart Supercenter) and then come roaring back at 90 megawatts a minute, about eight times faster than in a normal day, because after the shadow passes, the sun will be more nearly directly overhead. That organization, the California Independent System Operator, urged utilities to be ready; so did its counterpart in the Middle Atlantic states, the PJM Interconnection. PJM used to stand for Pennsylvania-Jersey-Maryland, but the system now extends into Virginia and West Virginia, Ohio and the Chicago area. Power grids are not set up for eclipses, which happen much faster than a sunrise or a sunset, and over a broader area than a typical cloud bank covers. The North American Electric Reliability Corporation, the entity that establishes and enforces grid rules, told other areas with high solar penetration, including Nevada and North Carolina, to prepare detailed analyses. California was in somewhat better shape because the drought is ending and more water is available this year; hydro plants can raise and lower their output very quickly. The next North American eclipse will be in April 2024, when the solar panel impact may be larger. Power systems have tried various means to cope. In 2015, Italy unplugged its large solar installations, to reduce instability on the system. But this problem can only become more serious as solar penetration increases. Most of Spain will be covered by an eclipse in August 2026. The obvious solution is to maintain a diverse generating portfolio that limits the threat to the system because of interruptions from any single source. UPDATE: Thanks to our friends at TVA for this stunning shot of the solar eclipse above the Watts Bar Nuclear Generating Station in Tennessee.